Be the leader that creative people need. 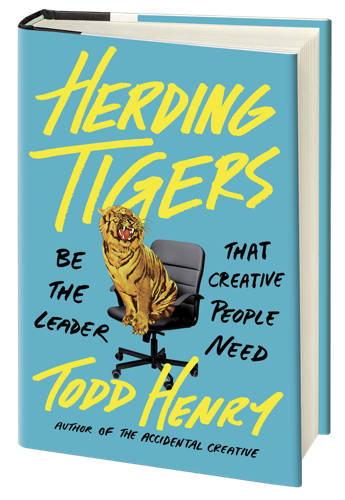 Herding Tigers will help you provide the stability and challenge your team needs to do its best work. Spend time with Todd Henry and other leaders just like you talking about how to be the leader your team needs. DOING THE WORK AND LEADING THE WORK ARE DIFFERENT THINGS. The old adage that leading creative people is like herding cats is wrong. It’s more like herding tigers. Doing the work and leading the work are very different things. When you make the transition from maker to manager, you give ownership of projects to your team even though you could do them yourself better and faster. You’re juggling expectations from your manager, who wants consistent, predictable output from an inherently unpredictable creative process. And you’re managing the pushback from your team of brilliant, headstrong, and possibly overqualified creatives. A primer on the definition of good creative leadership. Creative people need two things more than anything else: stability and challenge. To create stability, shift your mind-set from doing the work to leading the work. To create freedom, shift your mind-set from control to influence and from personal to total accountability. To create stability, you need to distance yourself (a bit) from your team. To challenge your team, you need to help people see those aspects of their abilities to which they are blind. To provide stability, you must earn, manage, and strive to maintain your team’s trust. To create stability, you have to actively grow a healthy culture. To challenge your team, boldly and effectively channel its collective attention. To create stability, manage your team’s margin by aggressing protecting “white space”. To challenge your team members, push them outside of their comfort zone. To create stability, recognize that conflict isn’t a bad thing. In fact, it’s a sign of a healthy and productive team. Your greatest impact comes not from the work you do — it comes from changing lives, including your own. Notes and further reading can be found here. Subscribe to the Leader List here. Subscribe to our podcasts here.